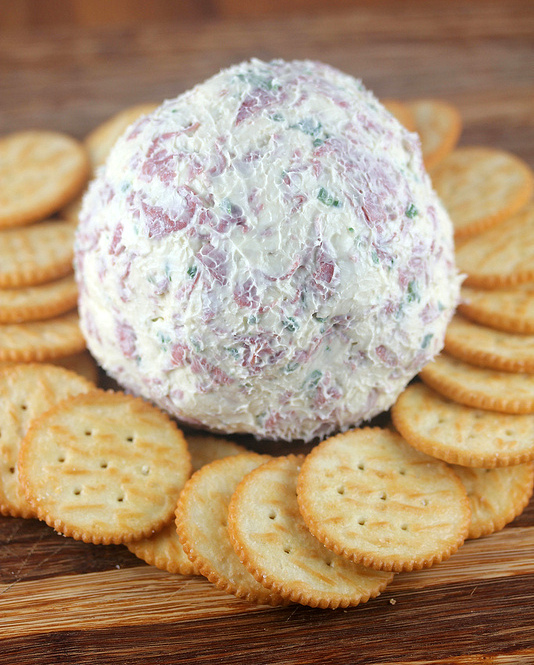 This cheese ball is perfect to prepare for a party. This appetizer will serve many people and can be served with crackers. To prepare this recipe it is very easy, just combine all of the ingredients, place the mixture into plastic wrap, and shape into a ball. The main ingredient of this appetizer is cream cheese but ingredients such as sliced pastrami and green onions add a lot of flavor. What is great about this recipe is how easy it is to prepare and only consists of 4 ingredients. Enjoy. Place the softened cream cheese in a large bowl and stir with a wooden spoon until creamy. Chop the pastrami into small pieces. Add the chopped pastrami and green onion into the cream cheese. Add worcestershire sauce and mix well. Lay out a sheet of plastic wrap on the counter. Add the cream cheese mixture and form a large ball. Unwrap and Serve with crackers of your choice.